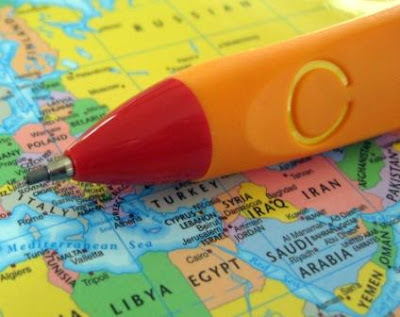 I’m sure we are all familiar with the international brands of writing instruments and mechanical pencils – the Pilots, Pentels, Faber-Castells, and Papermates of the world. 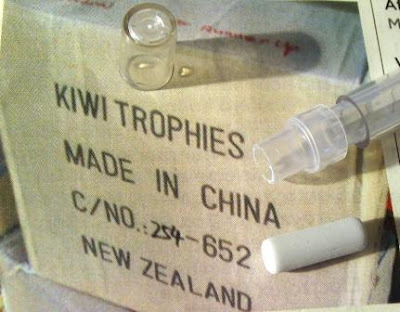 Not that long ago there must have been hundreds and hundreds of smaller national and regional brands around the world. Many of these are gone now, but some still survive. An example of this is Penol in Denmark, who ceased manufacturing themselves, but still continue as a national distributor of products under their own brand name. There must have been quite a few manufacturers and brands in Eastern Europe and the former Soviet Union. Surely some of them still survive as manufacturers or as importer-distributors of their own branded products? 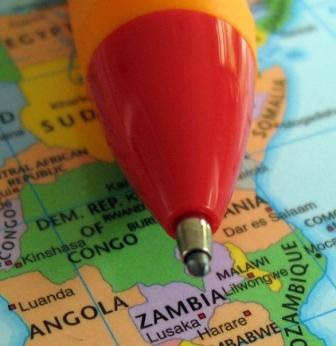 Anyway, I would be most interested to hear of any regional / national type brands that are still going in your part of the world. Leave a comment and let us know about the little guys still battling it out against the mega-corps. 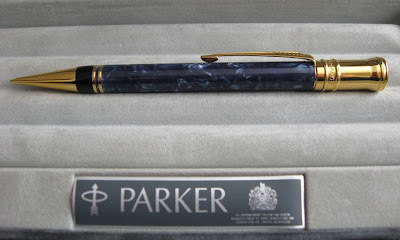 Back in 1988 Parker released their first Duofold since production previously stopped back in the 1940’s. 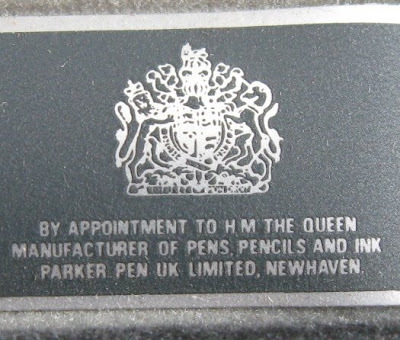 It was released as part of their 100th anniversary, called the Centennial model, and is made in England by Parker UK. I don’t have a vintage Duofold, but from pictures and other sources it appears the modern Duofold pencil is visually a very close match for the original Parkers. The barrel is acrylic, and mine is Lapis Blue (or Blue Mosaic or Blue Marble) colour. It is a very nice colour and the acrylic is very bright and shiny, but somehow it doesn’t have the depth of colour or intensity that I expected. I am a little disappointed to say that in my personal opinion old Conway Stewart Nippy pencils and their ilk have a depth and intensity of colour that outshines the Centennial. Now don’t get me wrong, the Centennial is a beautiful thing, it’s just I expected a little more in the colour department. 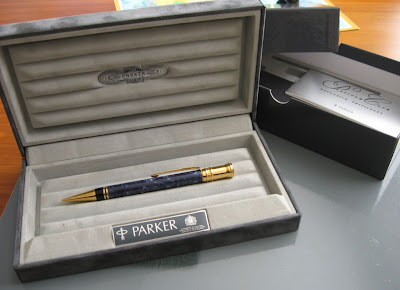 The presentation case is nice, with velvet flock covering, and notes Parker’s Royal Warrant. The gold trims are very classy. The mechanism is 0.9mm screw action - the lead is advanced or retracted by winding the gold top round. 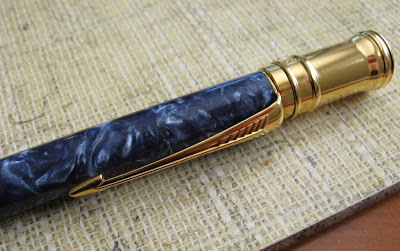 The eraser and its gold mounting ring are truly a sight to behold. 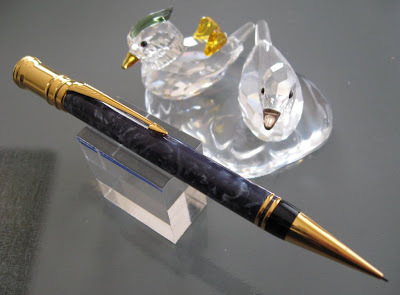 A very beautiful pencil, but you certainly pay a pretty price to own one! There are certain milestones that should be acknowledged, and one of these milestones has just passed for this blog. If I had a dollar for every page that had been viewed on this blog then I’d be living the Life of Riley because I’d be a millionaire. Yes, that’s right, my Sitemeter counter of Page Views has just ticked over the 1,000,000 mark. A couple of months ago I installed a Flag Counter that registers the country of origin of visitors. Sitemeter also does that, but doesn’t store the data long-term, so whilst I had a reasonable general idea of the locations of my viewers I didn’t have any cumulative data. My flag counter has currently recorded visitors from 118 territories, although 4 of the flags are flags of ‘Unknown’ (e.g. ‘Unknown – Asia/Pacific Region’, ‘Unknown – Satellite Provider’) so I don’t think they count. The flag counter has confirmed the obvious – given the language that I blog in, national populations and internet usage, it’s a no-brainer that the Big 4 of the Anglosphere (USA, UK, Canada, Australia in that order) would completely dominate my visitor locations. But beyond that, there have been a few surprises. I am surprised at Singapore showing up at 7th and Turkey at 19th, both considerably higher placings than I would have anticipated. 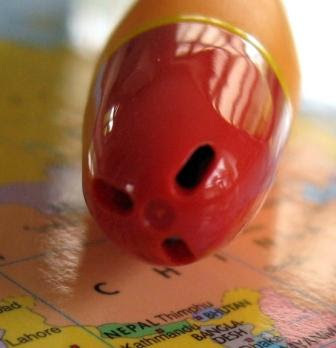 Given the popularity of stationery and pencils in Japan I shouldn’t be surprised at Japan being the highest ranking non-English speaking country, but for some strange reason I am. My antipodes are down in the south of Spain, so a special Hola! from the Antipodes to my antipodes. Speaking of Spain, I have been very surprised at how the Portuguese-o-sphere has been out-ranking the Hispano-o-sphere, with Brazil ranked 10th and Portugal 21st compared to Spain at 11th and Mexico at 30th. Of course, as always, I must say a special thanks to those of you who are regular readers, those who have sent me stuff over the years, correspond with me, link their sites here, make comments on this blog, etc. It is all much appreciated. Anyway, thanks for reading, hope you will continue to do so in the future. Low cost ballpoint pens with caps aren’t particularly common in my part of the world, but they used to be reasonably common back when I was in school. Perhaps that is why the Caplet has a somewhat retro and nostalgic feel about it for me. 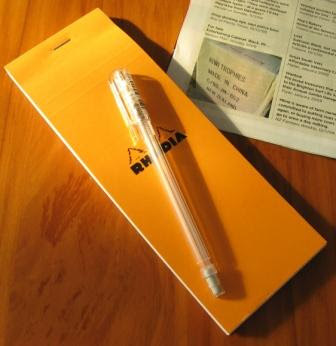 The Pentel Caplet is clearly a rather simple basic pencil, its point of difference being its cap. The cap covers the tip when not in use, providing total pocket safety. 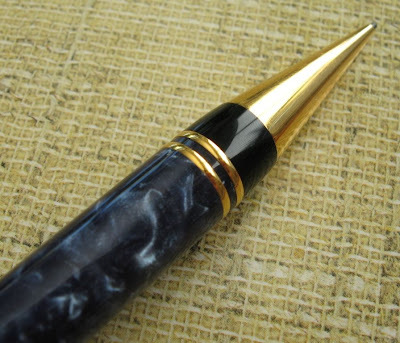 When you are ready to write, the cap can be posted onto the end of the pencil so you are les likely to forget and lose the cap. Posting the cap does have two disadvantages. 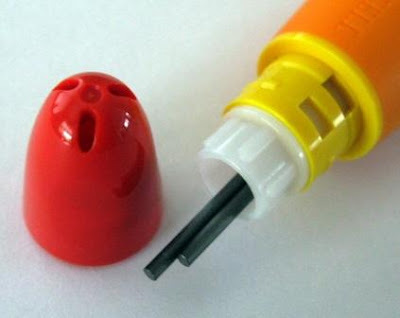 Firstly it fits over the eraser so that with the cap on, if you want to use the eraser you have to take the cap off, and then the eraser also has its own eraser cover to remove as well. Secondly posting the cap on the end activates the lead advance mechanism, which may not always be what you want. Personally I always chose to post the cap as without it the top end of the pencil looked somehow incomplete, I worried about losing the cap, and I preferred the little extra weight and top-heavy feel obtained with the cap on. The grip zone of the Caplet is a fairly narrow diameter and consists of a series of raised rings or waves. It is quite functional and successful. The lead advance mechanism is a standard push top button ratchet system. Ten clicks will get you 7mm of 0.5mm lead. With my clear transparent Caplet I quite like seeing the internal mechanism operate and advance and the lead as I click away. Rotating the body around gives various optical distortions of the leads inside the refill chamber making then change in diameter and even appearing square rather then round. In keeping with this clear theme the lead retaining ring in the tip is moulded from clear rubber. 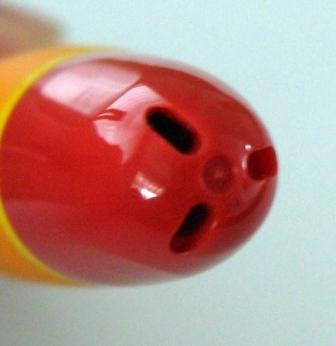 The eraser can be pulled out to refill the lead chamber. 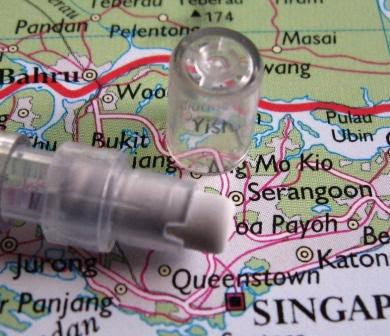 The eraser is 13mm long, but only about 3mm can be used as 10mm is inside the housing that holds it. 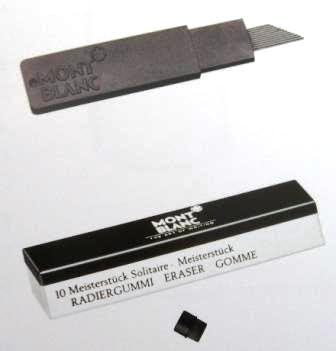 Personally I dislike seeing a dirty eraser stuck on the end of my pencil so the clear eraser cover is another reason I wouldn’t use the eraser except in emergencies. The cap has an integrally moulded pocket clip which is quite functional compared to many similar clips. A barcode is printed on a transparent label stuck on the cap and it is rather unsightly. You can of course remove the label, but the printing appears to be non-permanent as it scratches or rubs off easily. Rather strange. Overall then the Pentel Caplet is a good choice amongst the economy grade pencils. Best Points – The cap is something different for a change. Not So Good Points – Posting the cap advances the lead. Dimensions – Length 155mm with cap posted, diameter 8mmmm. Balance point about 85mm up from the tip with cap posted. 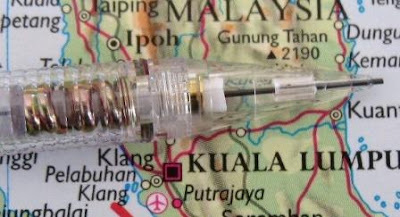 The Final Word - Thanks to 'Redds' from Malaysia for sending me this pencil. Please see the sidebar link - "My Wiki" and click on through. I'd appreciate any thoughts or comments on the ramblings contained therein. Here’s two of my options. 1 = Put a tenner aside each week, then in a couple of years I’ll be able to afford a Mont Blanc. 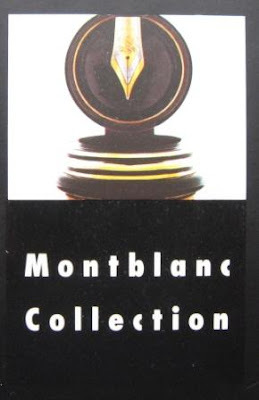 2 = Tell my wife there won’t be any holiday this year because I’m off to the Mont Blanc boutique this weekend. Maybe I should have a reader poll to see which I should choose? 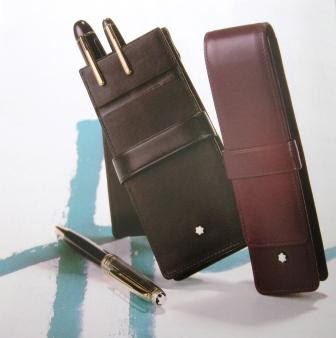 In the meantime though, whist I’m unable to afford a Montblanc pencil, I can afford a Montblanc catalogue full of pretty pictures! 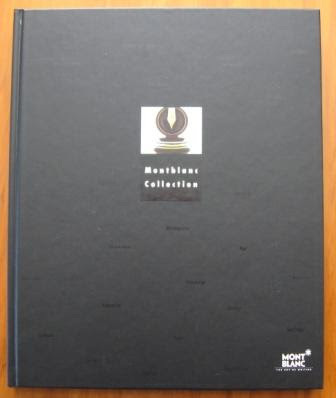 Here’s one catalogue, the "Montblanc Collection". It’s hardcover, a bit squarer than A4 size, 172 full colour numbered pages. I don’t know what year this catalogue is from. 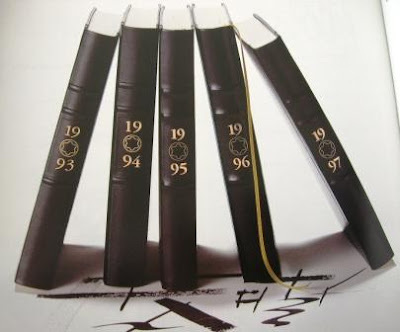 I suspect it is a 1997 updated reprint of the 1996 catalogue, as several photographs show series of annual diaries, with 1996 usually the last year pictured, but a couple show 1997. 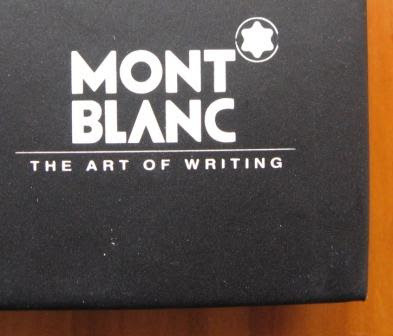 Montblanc really push the whole concept of “the writing experience”. 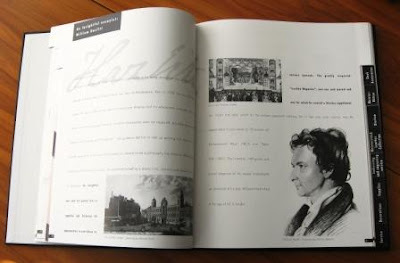 The catalogue is full of stories of famous essayists and writers from the past, and with your Montblanc you will be able to join that heritage, become one of the select few to experience the pure writing joy of putting a Montblanc to paper. Inspiration and words of importance will just pour forth. Yea well, I’d like one anyway. The pages are tab cut into sections for different writing instrument models and other products. 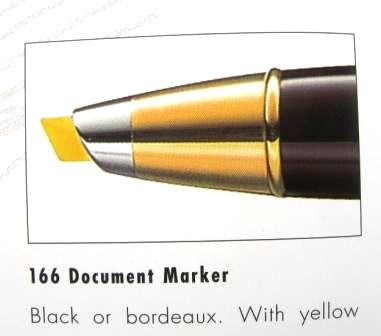 The Montblanc Meisterstuck Grand Document Marker (highlighter). That’s craaaaaa-zeeee! Hundreds of dollars for a yellow highlighter! Still I imagine many would say the same thing about the pencil too. Page after page of pens, pencils, diaries, pen pouches, etc etc etc. Some of the most expensive leads and eraser refills you can buy. Enjoy it if you can afford it. 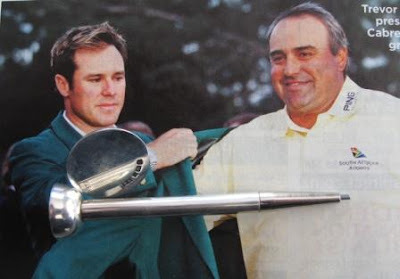 In my late twenties I did play golf for a few years, but I was only ever a hacker. 100 was a very good round by my standards. Still, I enjoyed the walk, the scenery and the camaraderie. Here’s a mechanical golf pencil I recently acquired. As you can see it is part of a set. 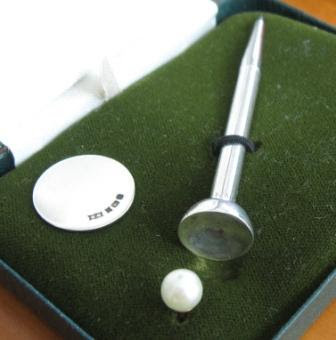 Sterling silver mechanical ‘tee’ pencil, sterling silver place marker, and a little (fake) pearl golf ball, with a case to complete the picture. 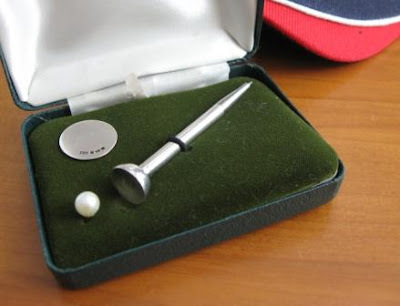 The golf ball looks quite similar to items I see in my wife’s ear. The silver carries British hallmarks for Sterling silver, Birmingham assay office, 1988. 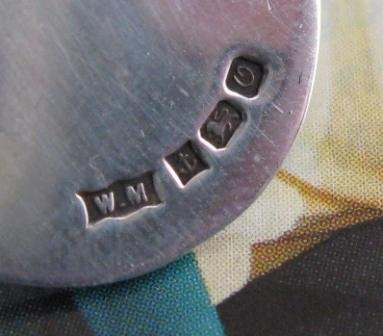 The makers mark is WM, being William H Manton, aka Birmingham Gold & Silversmiths Ltd, generally makers of boxes, candlesticks, cigar cutters, paper knives, pens and tastevin. 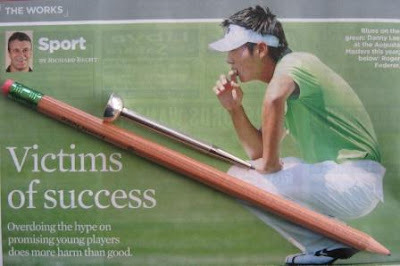 The pencil is itself a golf tee although I wouldn’t recommend using it for that purpose. Well, I suppose Tiger wouldn't care about the expense, but still, it seems a little wasteful. 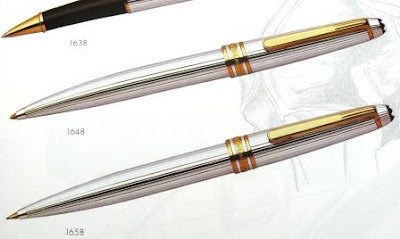 As a mechanical pencil it takes a little short length of 1.18mm lead. Tip feed, screw mechanism. Anyway, a nice shiny little novelty item. Without wanting to sound smart or smug, I’m particularly pleased with this acquisition because I got it for a song, for less than the price of a round of golf, and thats down here where golf is not expensive. FYI - I've just added the new Search This Blog gadget over in the sidebar. Its a little different to the old Search facility up in the header as it also searches some related places like pages that I've linked to. You may well question the title of this posting. Surely it should just be Faber-Castell Propelling Pencil Review? Maybe, but maybe not. At the time of writing, this particular pencil has me confused, and almost seems nameless. It appears on the Faber-Castell website new products section where it is pictured but not named, simply called the “the innovative Faber-Castell propelling pencil”. 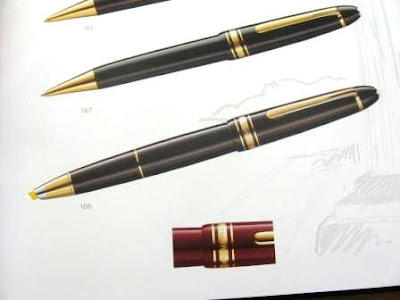 It is not shown on the main English language international website, but it is on a German language site where it is called “Der FABER-CASTELL Drehbleistift” which translates as “The Faber-Castell Propelling Pencil”. 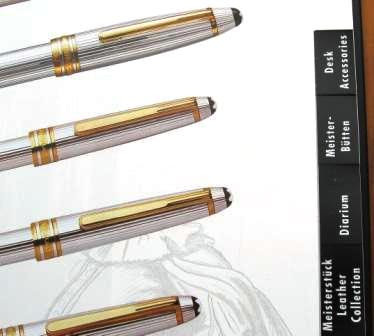 The German-English bilingual packaging pictured calls it ‘Drehbleistift’ and ‘Mechanical Pencil’. I’ll focus on the positive, and be happy that the product-naming folk at Faber-Castell have not emulated Stabilo. 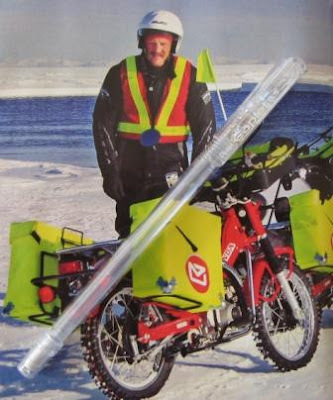 For the purposes of this review then I will call it the Propelling Pencil. Whatever its name, this pencil is Faber-Castells new entrant into the seemingly fast growing niche of oversize mechanical pencils for learner writers. It is available in four different colour schemes, mine is the orange and red combination. It really is a bright cheery colour scheme, and certainly stands out on a desk covered in papers. There is almost a hint of fluorescence about the orange. The short fat cigar shape also seems to contribute to an attractive little package. I noticed that it caught the eye of most people who came into my office whilst I was using it. Visually then, this pencil is a winner. The branding is subtle – Faber-Castell is moulded into the orange body near the top of the pencil, but you have to go looking to find it. Two sides of the pencil have a large “C” in them down in the grip area, which I presume is some reference to Castell, as well as possibly indicating finger position. 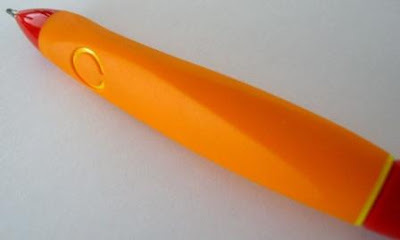 It appears the orange is an outer casing overlaid on a yellow coloured body underneath and the “C” is achieved by the orange outer layer not being moulded in that zone. There are three long scallops taken out of the round cigar shaped body to produce a triangular grip zone. The sides of the triangle are 14 – 15mm long in the main part of the grip zone. I know that I have previously found some other such jumbo learner pencils of similar dimensions to be too big for me, but somehow the Faber-Castell seems a much better fit for me. The short length of the Faber-Castell also seemed an asset at times, as many times I found myself holding it with the end cap in the centre of my palm and fingers running along its length. I often held it that sort of almost underhand style when I was crossing things off a list, scribbling things out, etc. The outer rubber casing is one that I have some respect for. It is a reasonably hard compound that doesn’t really move under normal finger pressure, but it is grippy - very grippy - and certainly does improve the grip factor. On the down side, it does seem to show up dirty marks, particularly any graphite smears from your fingers or papers that you may rest the pencil on. They can be cleaned off, but it does make me wonder what it would look like after a short while in a childs pencil case, but then most things look worse for wear after spending a week in a school pencil case. The Propelling Pencil uses 1.4mm lead which Faber-Castell seem to be preferring over the more common 1.3mm lead. I still feel that this is nothing more than an attempt to guarantee sales of refills by having an exclusive lead size, but fair enough I suppose. The lead supplied lays down a good smooth line. It’s not any sort of economy lead for children. 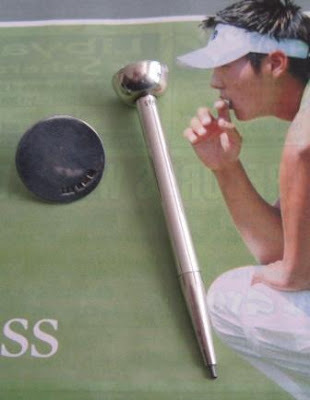 The lead sleeve is a short metal pipe and is retractable for transport. The lead also has some spring cushioning, which might be superfluous on a strong thick lead like 1.4mm, but then this pencil is for children so it might come in handy. 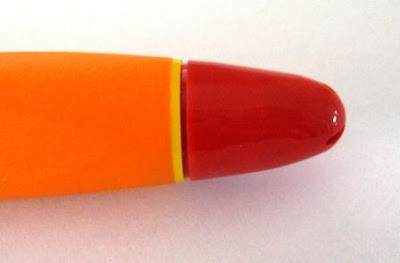 The red end cap can be pulled off for access to the lead refill magazine. There is no eraser. The end cap has three quite large slots in it as airholes just in case some youngster swallows the cap. They are sized so that the leads will not fit through and children can’t use them as some sort of lead shaker. The lead advance is a twist action ratchet. The red end cap twists clockwise through about 150 degrees to advance the lead, and then springs back. 10 activations will get you about 11mm of lead. I am slightly dubious about the choice of twist action over push top for a learner pencil, but then it might cut down on youngsters playing around with the pencil. The really unusual aspect of the mechanism though is its lock and retract feature. Twisting clockwise advances the lead, but if you twist it anti-clockwise then there is a loud click and the end cap stays fixed in that position. The lead and the lead sleeve can then be easily pushed back up into the body. You don’t have to do any of the ‘push and hold to retract’ action that is common with most mechanical pencils. This is quite an interesting feature, and probably of some advantage to younger folk. I have concentrated on the Propelling Pencil in relation to learner writers, but unlike some other recent learner pencils, I really liked using this pencil myself and would recommend it to both adults and children alike. Best Points – Bright cheery colours. Interesting locking mechanism. Not So Good Points – 1.4mm is just a fraction too large for many users. Now if they also offered a 0.9mm version…! The rubber grip seems a little prone to showing dirty marks. Does this pencil make it into the Top 5? – Tempting, but no. Dimensions – Length 113mm, diameter 17mm at widest part. Balance point about 60mm up from the tip.